Knowing how to read your bill is a good way to monitor your exact electricity and water usage. Use this list of definitions to better understand the breakdown of your bill. This section contains important information about your account, including balance, previous balance, and date of last payment. This section provides you with all of your meter information, including meter type, meter number(s), read date(s), usage registered and loss percentage. See the Glossary Of Terms for more information. 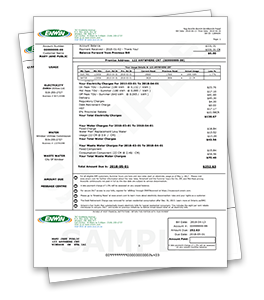 This section contains a detailed summary of your electricity charges. The Glossary Of Terms (also found on the back of your bill) will help you understand what these charges are. Click here for Electricity Rates. This is a fixed monthly charge that is set based on the size of the meter connected to your address. This charge is used to pay for the distribution system and treatment plant, including upgrades and replacements. This charge is based on 45% of the sum of the Meter Fixed Charge plus Water Usage and is used to pay for the replacement of watermains. This charge is determined based on the amount of water (CM – Cubic Metre) consumed at the address during the billing period. This charge is used to pay for the distribution system and treatment plant, including upgrades and replacements. Click here for Water Rates. The fixed component portion is determined based on the size of the meter connected to your address. The consumption component is determined based on the amount of water (CM - Cubic Metre) consumed at the address during the billing period. Click here for Waste Water Rates provided by the City of Windsor. In this section you will find notes about payment conditions and current promotions/customer initiatives taking place at ENWIN and Windsor Utilities Commission. The graphs help you compare your electricity and water usage from month to month. The date at the top of each bar on the graph represents the end date of the billing period. ELECTRICITY - This is the cost of the electricity supplied to you during this billing period and is the part of the bill that is subject to competition. DELIVERY - These are the costs of delivering electricity from generating stations across the Province to ENWIN then to your home or business. This includes the costs to build and maintain the transmission and distribution lines, towers and poles and operate provincial and local electricity systems. A portion of these charges are fixed and do not change from month to month. The rest are variable and increase or decrease depending upon the amount of electricity that you use. ENWIN collects this money and pays this amount directly to our suppliers. LOSS % (LINE LOSS ADJUSTMENT) - It is normal for a small amount of power to be lost as it travels over the utility's power lines to your home or business. In calculating your electricity costs for the billing period, ENWIN multiplies your electricity cost by an adjustment factor that accounts for those losses. They do this using an adjustment factor that is approved by the Ontario Energy Board. The charges for losses are included on the Delivery line of your bill. REGULATORY CHARGES - Regulatory charges are the cost of administering the wholesale electricity system and maintaining the reliability of the provincial grid and include the costs associated with funding Ministry of Energy and Infrastructure conservation and renewable energy programs. DEBT RETIREMENT CHARGE - The debt retirement charge pays down the debt of the former Ontario Hydro. GLOBAL ADJUSTMENT - Electricity generators in Ontario receive a combination of payments from the operation of the wholesale market, payments set by regulation and payments under contracts. Your portion of the net adjustments arising from these and other authorized payments is included on your bill as the Global Adjustment. FIXED CHARGE - Fixed monthly charge based upon the size of meter connected to your address. WATER USAGE - Amount of water (CM - Cubic Metre) consumed at the address during the billing period. WATER MAIN REPLACEMENT LEVY - 45% of the sum of the Meter Fixed Charge plus Water Usage. WASTE WATER FIXED COMPONENT - Fixed monthly charge based upon the size of the meter connected to your address. WASTE WATER FIXED COMPONENT - Calculated at a rate per amount of CM (Cubic Metre) of water consumed at the address during the billing period. For an additional explanation of electricity terms, visit ontarioenergyboard.ca, contact ENWIN's Call Centre at (519) 255-2727 or email: info@enwin.com. Please note: The information included in the above bill is only an example and may not include the most current approved rates.